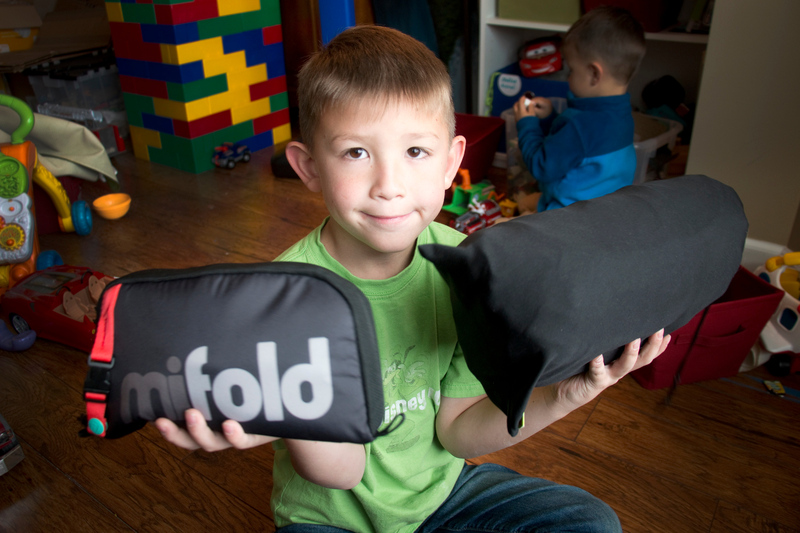 Comparing Travel Booster Seats: mifold vs. Bubble Bum Mama Say What?! | Mama Say What?! We’re a family that travels quite a bit by air and I’m sure all of us parents can agree that flying with a convertible car seat or a high-back booster seat can be a huge pain. There’s the stress of having to carry it along with your luggage all while wrangling your kids. There’s also the stress that the seats might get damaged and dirty if they are checked. Renting through car rental companies comes with the risk of the seats being filthy or damaged, or even the wrong kind of seat for your child. Once we tried to rent a convertible car seat for our 20-month-old and they gave us a high-back booster seat. Nope! 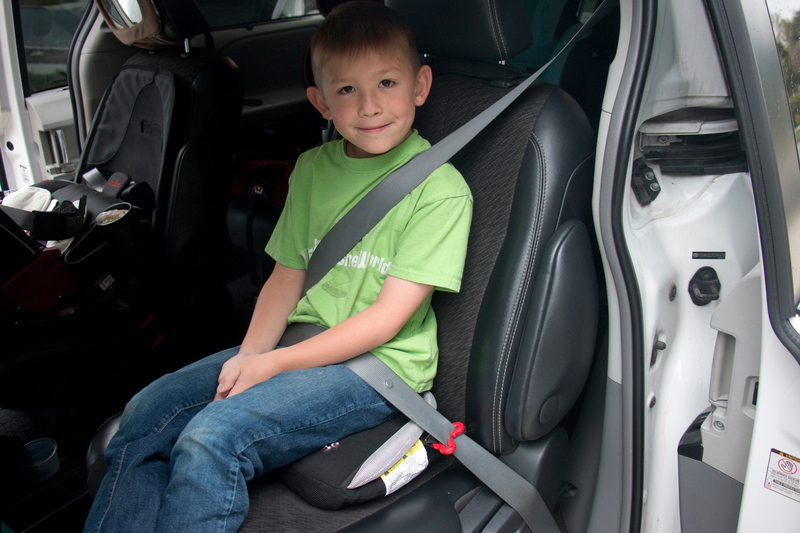 When our oldest son was old enough to ride in a booster seat safely, we started looking at options for travel booster seats. Most backless booster seats are still decently bulky to fly with, many are too big to stash in a backpack, and none are approved for use on an airplane. So they end up checked or shoved into an overhead bin. And I don’t know about you, but I’m notorious for forgetting that I put anything in the overhead bin. Then we found the Bubble Bum: a backless, travel booster seat that is inflatable. It comes with little clip thingies on each side to secure the seat belt in the correct position. It’s pretty compact, it rolls up to about half of its fully-inflated size and fits inside a fabric cinch bag that is included. It’s easy to fly with, but still takes up a good chunk of space in a standard backpack. We usually attach it to a backpack strap with a carabiner if we’re short on space. It seemed to be a great solution and made air travel and rental car trips a little easier for us. 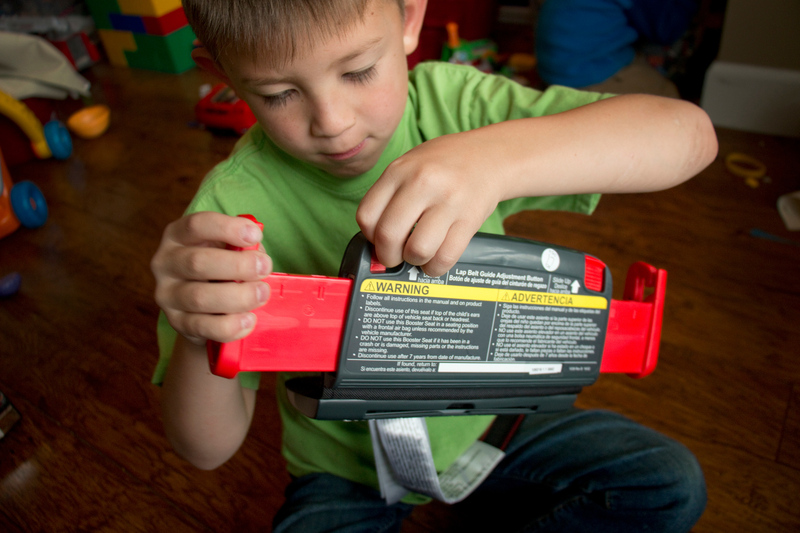 It’s easy to inflate by blowing into the valve, my son can easily do it himself. Unfortunately, he really dislikes the Bubble Bum. Right now he’s 8 years old, a little over four feet all, and about 54 pounds. When he’s riding in a car and it turns a corner, he often falls off the Bubble Bum. The only times he can stay put is if he’s in a bucket-shaped seat of some kind or if he has arm rests, like in the captain’s chairs of a minivan. Otherwise, he’s sliding all over the place, constantly struggling to physically stay ON the booster seat. He is essentially riding on a balloon. 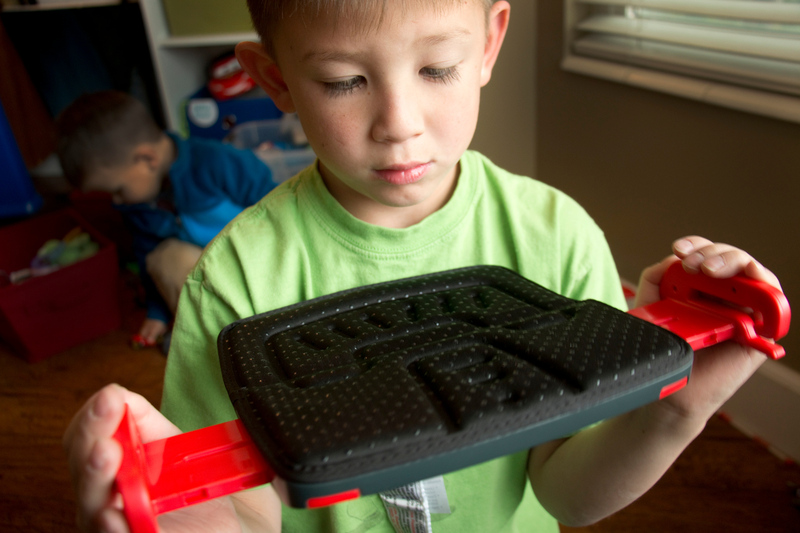 It did its job for the most part, but how safe is a booster seat if the kid struggles to actually stay on it? We started looking for other options. 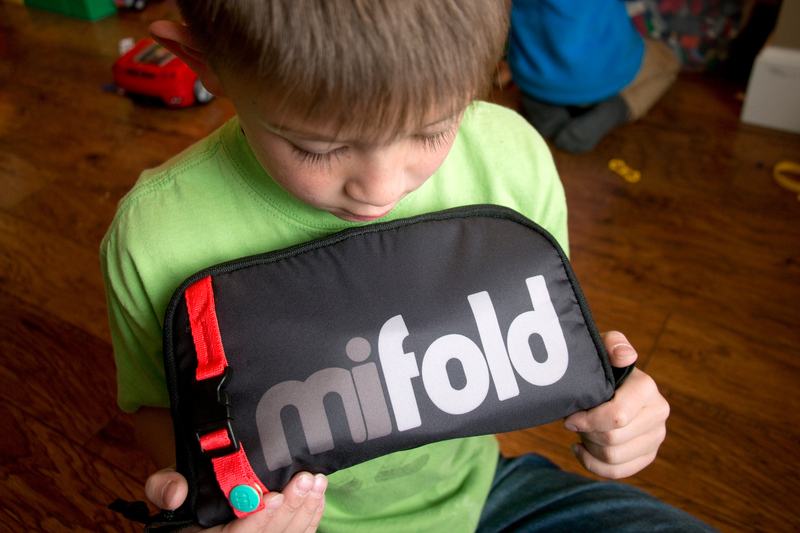 Enter the mifold Grab-and-Go Booster Seat. 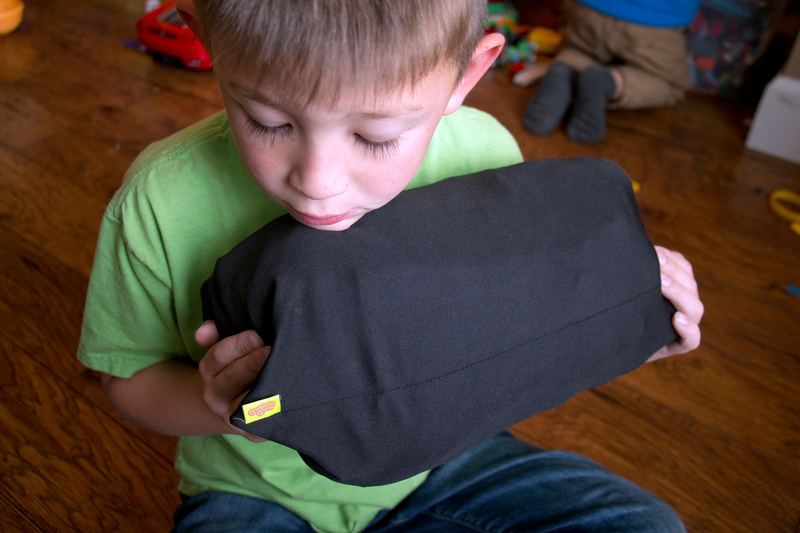 My husband and I first saw mifold’s travel booster when they were featured on Kickstarter, even before they had been fully safety tested and able to ship product to anyone. The concept sounded really, really cool. 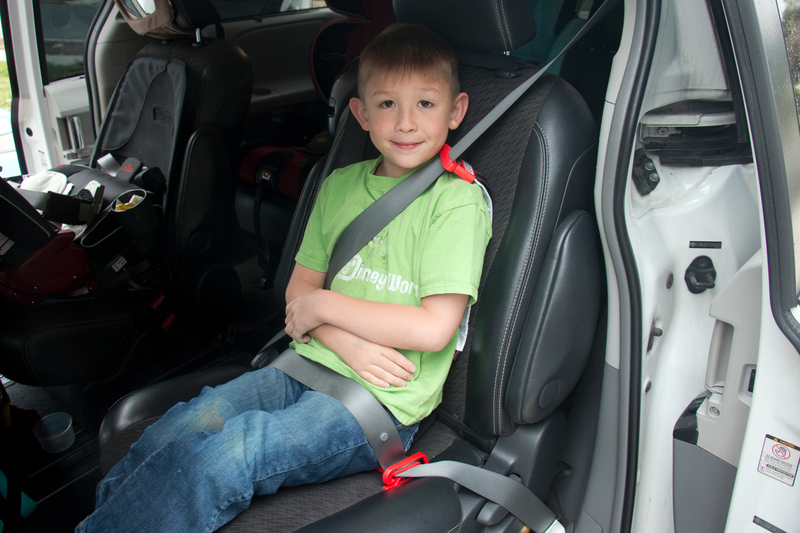 Rather than boost the child up to where the seat belt rests in the right spots on their body, the mifold pulls the seat belt down to the correct position. We were intrigued and kept and eye on them to see when they’d be ready to ship. 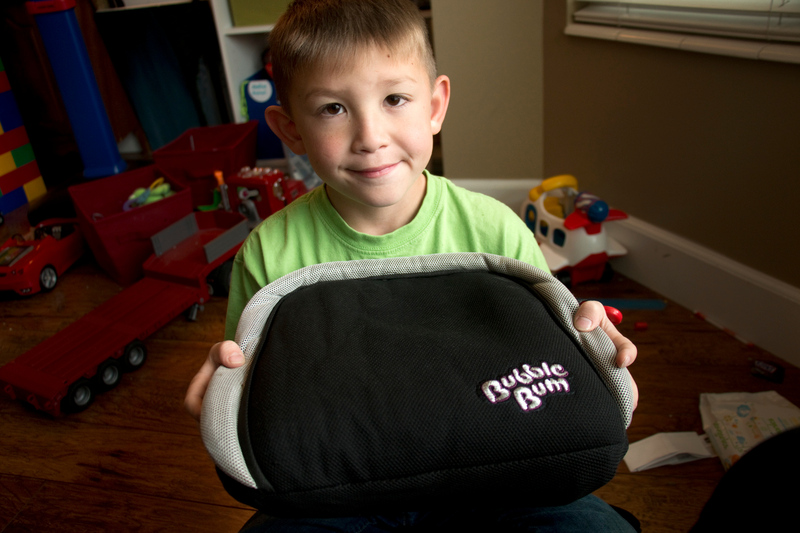 They’ve since been safety tested and meet or exceed NHTSA standards for a backless booster seat in the U.S. They’re now available almost everywhere; Amazon, Buy Buy Baby, Babies R Us, and Target. We picked up a mifold Grab-and-Go Booster Seat a little while back and it’s been a really nice improvement over the Bubble Bum. 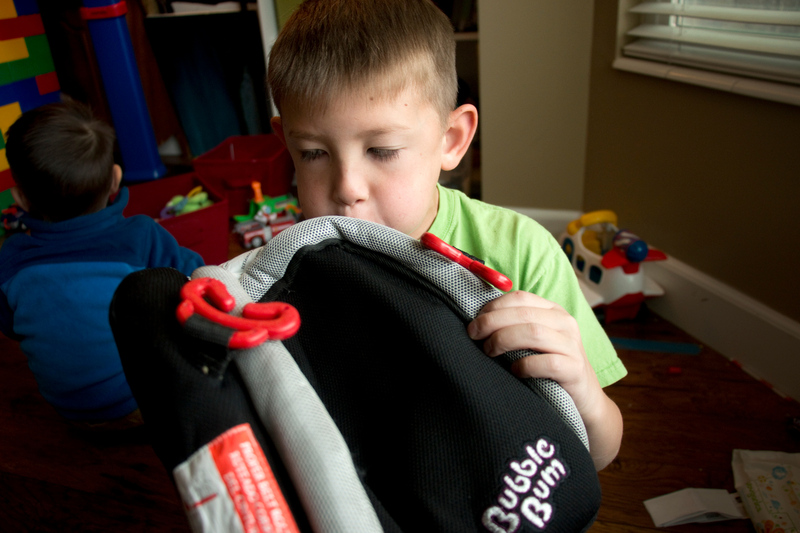 For starters, it’s smaller when folded than the Bubble Bum, so it fits in backpacks a way easier. My son is enrolled in an afterschool program three days a week that picks him up from school, so the mifold stays in his backpack and goes to school with him, and doesn’t take up a ton of space. It’s also great for field trips, and when he rides in a friend’s vehicle. It’s fantastic for air travel too when we need to take a taxi, Uber, Lyft, or when we rent a car. There has been a little bit of a learning curve for my son when buckling himself into and out of a seat belt. The seatbelt has to be threaded through hooks on either side after the width of the those hooks has been adjusted. It feels quite secure though and keeps its width when being used. The mifold is not nearly as quick to put on as when he’s riding in his high back booster, but after figuring it out over the course of a four-day trip in Seattle earlier this year, he had a system figured out. He leaves the seatbelt hooked on one side so it’s easy to put on the next time. He has said more than a few times that he likes it much more than the Bubble Bum. Most importantly, it’s comfortable for my son. He doesn’t slide around and fall off the seat when the car turns a corner and it places the seat belt in a safe position for his little body. I’ve read other reviews claiming the mifold tends to slide around and fold on itself when being used, but this hasn’t been our experience. It’s been a clear winner for us and I’m planning to buy them for friends once their kids are old enough for booster seats. Disclaimer: I purchased these booster seats and all opinions are my own. I was not paid for this review, but there are affiliate links in this post. Using them helps keeps our website running and it’s much appreciated. Added by Alex T. on December 5, 2017.